The Personal Automobile Policy (PAP) that covers the vehicles that you own contains an exclusion that is very important if you are an Uber or Lyft driver. This exclusion specifically eliminates coverage for liability arising out of the ownership or operation of any vehicle while it is used to carry other people for a fee (livery). The PAP will not respond to any claim arising from an accident that occurs while you are operating your vehicle as a TNC (Transportation Network Company) driver. To fill the gap created by this exclusion, the TNC’s have arranged coverage that applies when your Personal Automobile Policy doesn’t. There are three insurance-related phases when driving for a TNC, (such as Uber or Lyft) and coverage will differ depending on the phase. In Phase 1, the driver has the app turned on and is waiting for someone to call them. Phase 2 begins when the driver has been contacted by a customer and the driver is on the way to pick up the customer. Phase 3 starts with the customer in the car and traveling to his/her destination. While you’re online with Uber and before you accept a request, you are insured for your liability to a third party if you are in an accident when you’re at fault, by a policy maintained by the TNC. A third party is someone other than yourself. Coverage includes your liability to pay another person’s medical bills or to pay for property damage (like a damaged fence). $75,000/$150,000/$25,000 of insurance between trips. 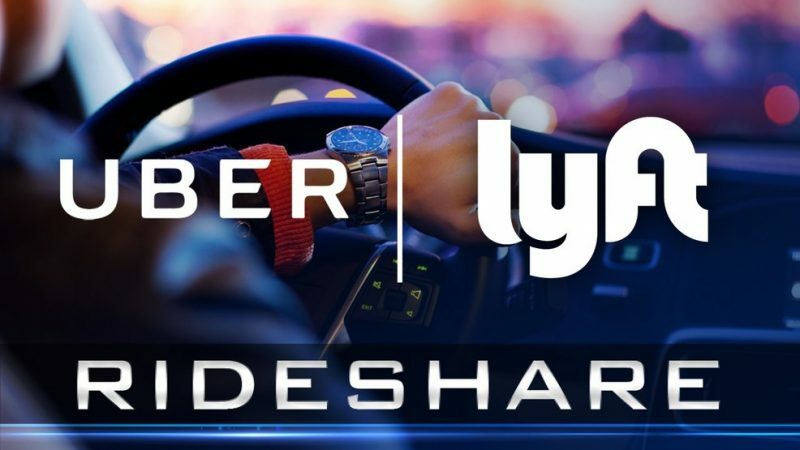 During the time that a TNC Driver is available to receive ride requests or is between trips, Uber maintains a group ride sharing policy that insures the TNC Driver’s liability for bodily injury up to $75,000 per injury per accident with a total of $150,000 per accident and up to $25,000 for property damage. Uninsured motorist bodily injury insurance per covered accident. In the event that another motorist causes an accident with a TNC Vehicle and the motorist is uninsured, this insurance protects against bodily injury to all occupants of the TNC Vehicle. This insurance provides up to $25,000 in injury liability per person ($50,000 per accident) and $50,000 per person for death ($100,000 per accident). This is important to ensure protection in a hit and run. No fault coverage (e.g., Personal Injury Protection). This state required coverage protects you for medical and health expenses, lost earnings, and other reasonable and necessary expenses resulting from vehicle related injuries up to $50,000. $1.25 million of liability insurance per covered accident. Uber maintains a group ride sharing insurance policy with $1.25 million of coverage per covered accident. A TNC Driver’s liability to third parties is insured from the moment a TNC Driver accepts a Pre-arranged Trip to its conclusion. This policy is expressly primary to any personal auto coverage. $1.25 million of supplementary uninsured/underinsured motorist bodily injury insurance per covered accident. In the event that another motorist causes an accident with a Transportation Network Company Vehicle (TNC Vehicle) and the motorist doesn’t carry adequate insurance or is uninsured, this insurance protects against bodily injury to all occupants of the TNC Vehicle. This is important to ensure protection in a hit and run. No fault coverage (e.g., Personal Injury Protection). This state required coverage protects all occupants of the TNC Vehicle for medical and health expenses, lost earnings, and other reasonable and necessary expenses resulting from vehicle related injuries up to $50,000. Contingent comprehensive and collision insurance. 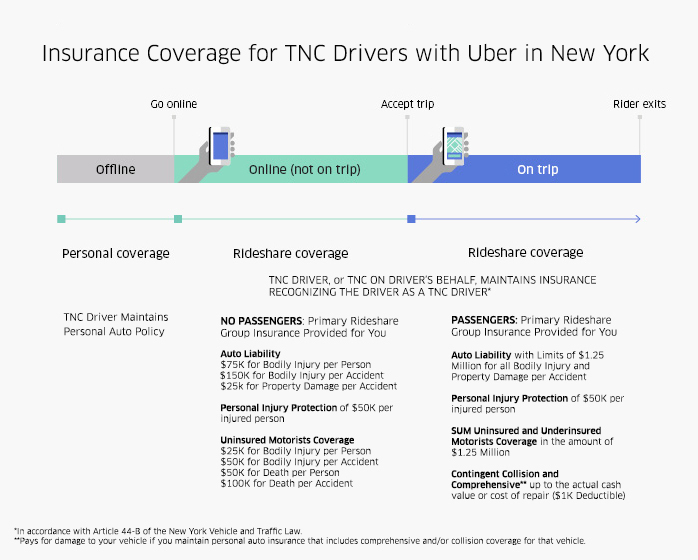 If a TNC Driver maintains personal comprehensive and collision insurance, Uber’s insurance will kick in and provide physical damage coverage for that TNC Vehicle during a trip, up to the actual cash value or cost of repair, whichever is less, of the TNC Vehicle, with a $1,000 deductible. NOTE: This coverage only applies on a Prearranged Trip. Since you are not driving on the Uber platform during this period, you are not covered by the insurance Uber maintains for driver-partners. Any accidents that occur in your car while not driving on the Uber platform are covered by the Personal Auto Insurance coverage that you purchase on your own. TNC drivers must carry proof of insurance at all times during TNC driving. The state Department of Motor Vehicles will prescribe the form, which may be the same as the current insurance ID card. TNC drivers would still need an ID card from their personal auto insurer. When a driver is required to produce an ID card, he/she should produce both their personal auto insurance ID card and one provided by the TNC’s insurer.